Thanks to A Very Cherry World for hosting . Check out everyone's reds here. I decided to share my red shadow boxes. I made one for my Hubby who is an ex Navy guy and one for My Son who is a Trombone Guy. I used vintage frozen charlottes and sheet music and books in them. I had so much fun putting them together and they are hanging on our hall wall. I bet most of you don't know what this is. It's my Mom's vintage MahJong Game. She was an avid player-I have yet to learn. She probably got this one from a garage sale. It looks like it's never been used. It opens up and you can see the trays of tiles. They are really pretty. 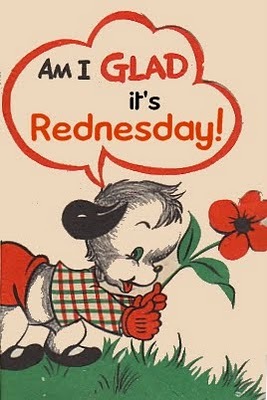 Hope you all enjoy your day. Happy Reds! 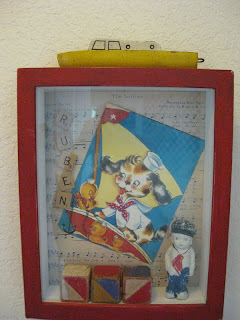 I love the shadow box idea, very cute indeed. 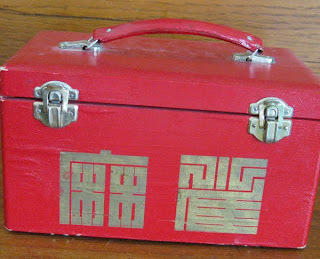 What a darling little box, that is a really neat treasure! Love your shadow boxes, so much fun! Could you possibly direct me to the history of the "frozen Charlotte's" - that gal is all over the place teehee! I love her and I don't know anything about her. I've never seen a mahjong set before, but I play it all the time online! I have to play one game before I get off the computer. Just one of my little quirks! 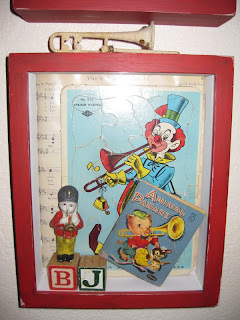 I love your shadowbox, but I didn't know what frozen Charlottes were, so I had to Google it. I see those all over the place, but had no idea there was a name for them. I learn something new every day in blogland! 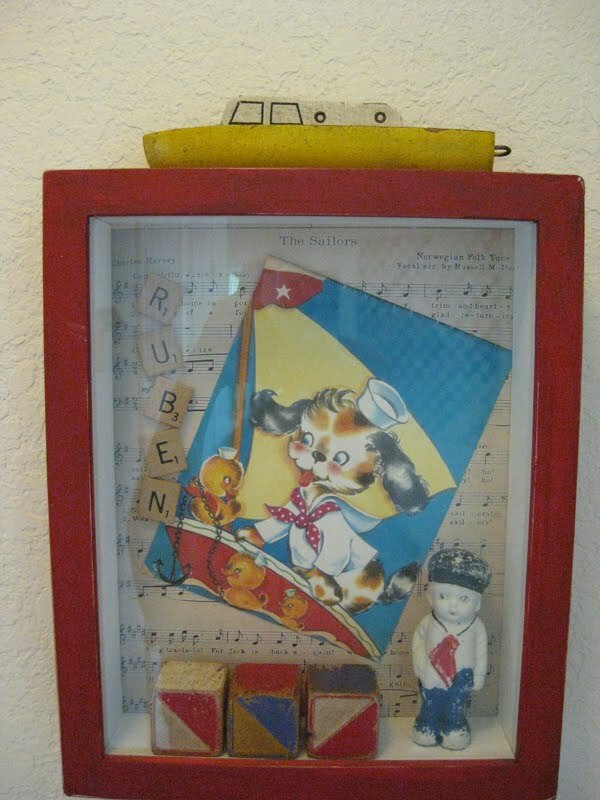 Love your shadow boxes, they are really cheerful displays. Thanks for popping by and choosing a red bag, it's always nice to meet new friends. OOHH...love the Mah-Jong set. It is a fun game and addictive. 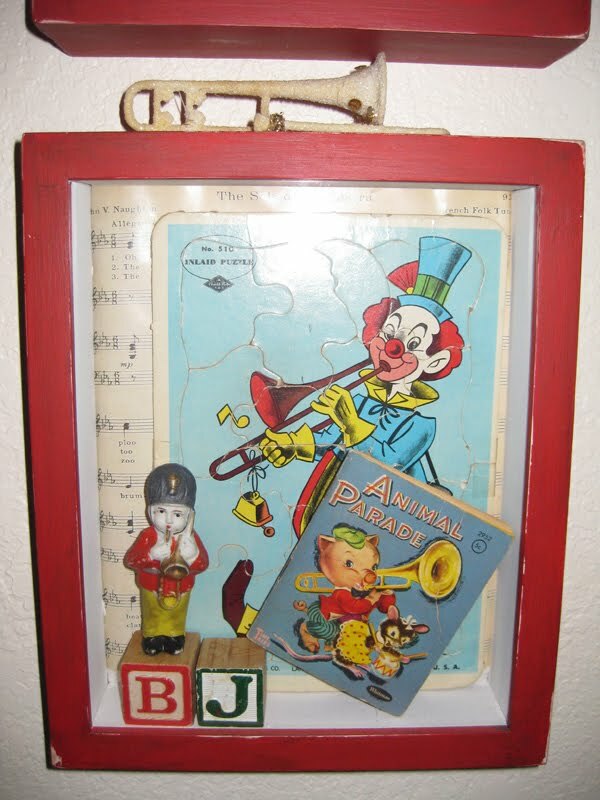 darling shadowbox! I've never heard of the game...looks fun, and it's in a cute red box! Hi! Thanks for visiting my blog. Your shadow boxes are so cute. 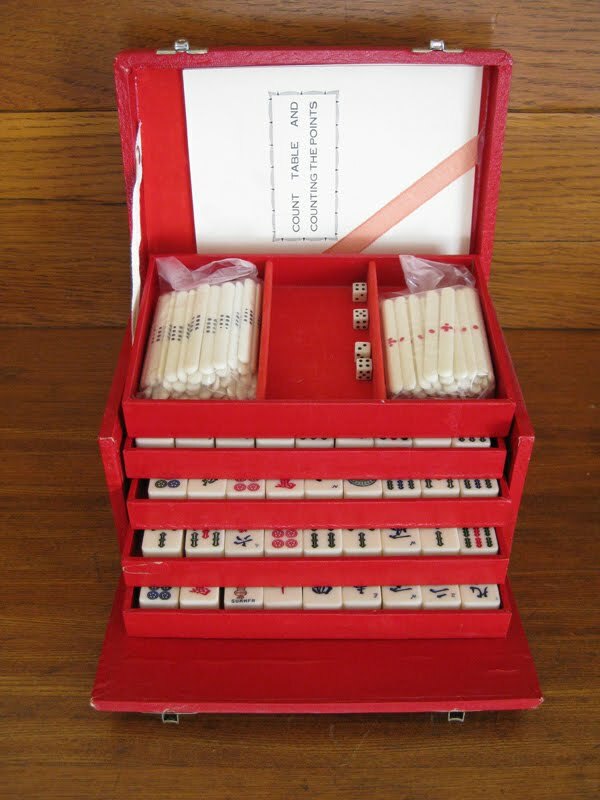 I've never seen a Mah-jong set-- I want to learn to play just so I can buy a set too. I love the shadow boxes , you did a marvelous job making them . I have never played Mah-jong . It looks interesting . Very nice shadow boxes! That mah jong case is beautiful! Oh, and I love Max's pic in the previous post! Hi, I love both of your shadow boxes, they came out so nice! I've never heard of Mah Jong, very interseting. Thank you for sharing somthing so unique that was your moms. Thank you for visiting and leaving your kind comment on my “Rednesday” Rose Centerpieces"! I really enjoyed making those arrangements, and loved the green and off white tin flower pots.